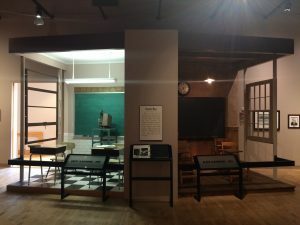 One of the most striking exhibits at the beginning of the Civil Rights Institute was the side-by-side comparison of two school classrooms c. 1953. Recently I traveled to Birmingham, AL with my husband, somewhat on a whim for a long weekend. We solicited advice from friends on what we shouldn’t miss in the city, and the one thing that kept coming up in the recommendations was a trip to the Birmingham Civil Rights Institute. We added that to our list of places to visit during our trip, and planned to go on our second afternoon in the city. What we did not realize, and to our pleasant surprise, was that at almost every single place we visited, segregation and civil rights were seamlessly woven into the history. Besides the Civil Rights Institute, the most obvious place to explore civil rights history was across the street at the 16th Street Baptist Church, where we viewed an exhibit, watched a short film, and participated in a Q&A with a church member about the bombing in 1963. But even at the Sloss Furnaces National Historic Landmark, a city park, and the location of the “original iron man,” civil rights history was front and center. If you’re looking for a long weekend trip to immerse yourself in exploring the Civil Rights Movement in America, Birmingham, AL is the place to go. 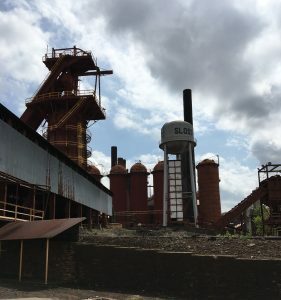 Sloss Furnaces was a major draw for many formerly enslaved men who were looking for work after the Civil War, and it played a prominent role in the growth and development of the city of Birmingham.